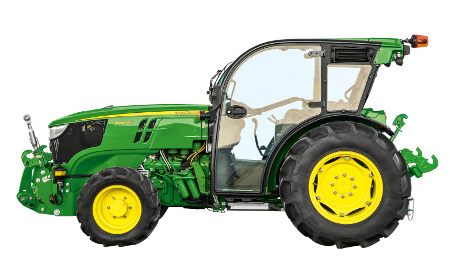 Meet the John Deere 5G Series Speciality tractors. 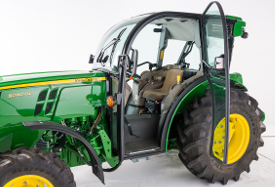 These tractors are built to outperform in a variety of different applications. They are easy on the soil, light on fuel and both powerful and versatile enough to take care of a wide range of everyday tasks. The 5G Stage IIIB Series provides the most comprehensive range of solutions for crop farming. 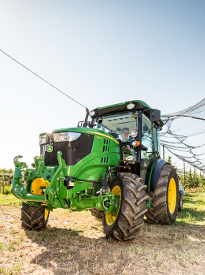 While the 5GF provides excellent performance in wide vineyards and orchards, the 5GN is the solution of choice for narrower row widths up to 185 cm (72.83 in.). Both the 5GF and the 5GN feature an extra-wide cab of 120 cm (47.2 in.). 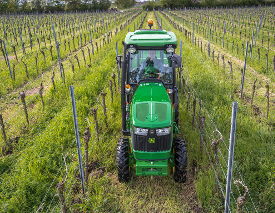 The super-narrow 5GV Series is built to operate in vineyards with a minimum working width of 160 cm (63 in.). Even though there is more space inside the operator’s station, the redesigned cab frame of the 5GV Series provides a narrower overall width of only 100 cm (39.37 in.) 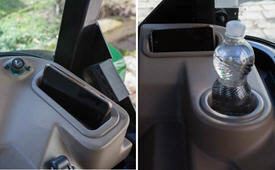 between the door handles in order to avoid interferences with crops and branches in narrow vineyard rows. With the lowest possible height from the center of the rear axle to the top of the hood of 800 mm (31.5 in.) the 5GL is a real low-profile solution. 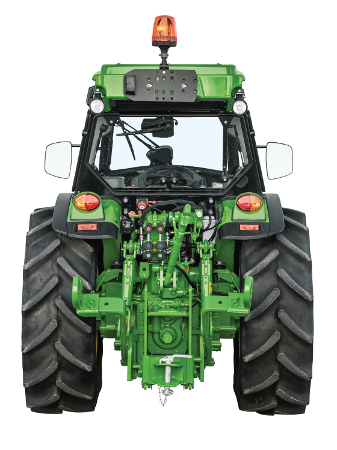 In terms of tractor width, the 5GL (Low-Profile) Series is based on the 5GF Series (F-width). The 5GL Stage III B Series offers two more width options. The 5GL Series can be ordered with different front and rear axle combinations in order to reach a narrow overall width similar to the 5GN Series. This allows the perfect fit for different orchard plantations where branches and fruits limit the row width size like kiwis, apples, or peaches. Furthermore, the narrow version of the 5GL Series is available with low-profile cab ex factory. Different to various aftermarket solutions, the low-profile cab is fully homologated and comes without any additional rollover protective structure (ROPS). Furthermore, the interior has been completely redesigned as per other cab tractors. 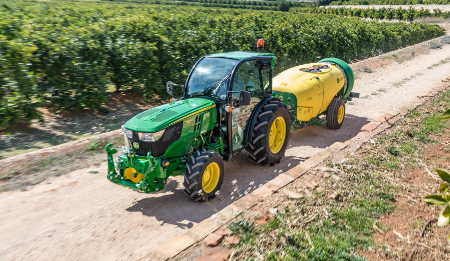 With the low-profile cab, the operator is able to safely perform spraying applications in a wide range of orchard and vineyard rows, where either the tractor width or the tractor height is a limiting factor to avoid interferences with crops or branches. 5GL (N): Available as open operator station (OOS) version only. 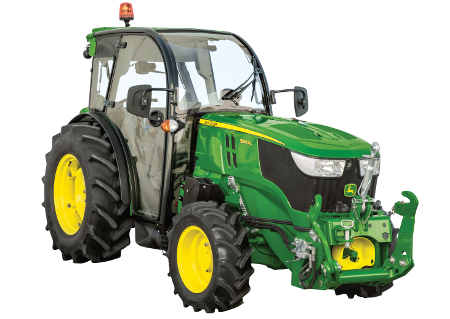 The tractor overall width is based on the 5GN Series. 5GL (N/F): Available with the low-profile cab only. 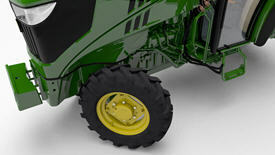 The tractor overall width is between the 5GL N-width and the wider 5GL F-width version. 5GL (F): Available as OOS version only. The tractor overall width is based on the 5GF Series. 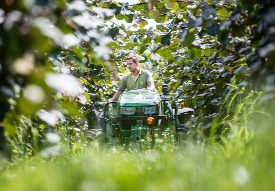 Performance: Tailored to fit – the ideal match for all kinds of plantations. The cabs for the 5GF, 5GN, and 5GV Series have been redesigned to fit the needs of producers of different high-value crops. The 5GF and the 5GN Series feature an extra-wide cab at 120 cm (47.2 in.). The 5GV Series cab, with an overall width of 100 cm (39.4 in. ), is designed to operate between narrow vineyard rows. While the 5GF, the 5GN, and the 5GV Series continue to feature an extra-wide cab and a super-narrow cab, the overall roominess inside the cab has been increased up to 10 percent. The increase of the roominess inside the operator stations has been made possible through a redesign of the consoles and a height reduction of the transmission tunnel. The left- and the right-hand consoles have been completely redesigned. 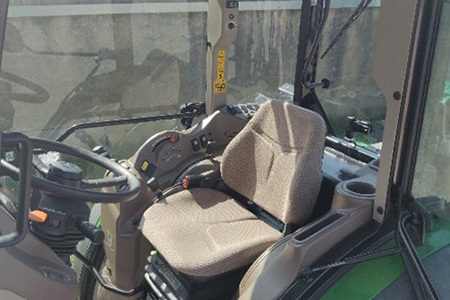 There is more space between the consoles and an improved location of all controls which are frequently used for headland turns between vineyard and orchard rows. The operator’s station has been raised in order to improve visibility. At the same time, the height of the transmission tunnel has been reduced by 33 percent to 160 mm (6.3 in. ), which provides more space and comfort during daily operations. 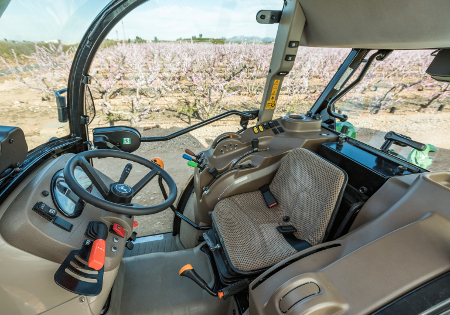 Even with a narrower cab, the roominess inside the 5GV cab has increased so that a super deluxe seat can be ordered together with the electronic rockshaft. Also, the dashboard and the steering column have been redesigned. When the 5G Series are ordered with a PowrReverser™ transmission, the reverser lever is located closer to the steering column. This results in a more convenient way of reversing without the need of releasing the steering wheel. NOTE: The 5GL Series can also be equipped with the PowrReverser transmission, but the styling of the steering column and the lever follows the design of the Stage IIIA Series (model year 2014) in order to maintain the low height of the 5GL Series. Furthermore, the layout of the 5GF, 5GN, and 5GV operator stations provide more storage locations, including a bottle holder, which all come as base equipment. 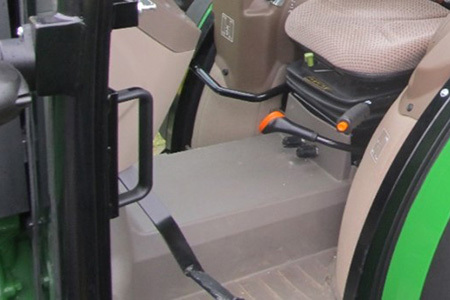 In order to guide rear attached implements into narrow rows even on slopes, the optional comfort implement control is available for the 5GV Series. The electronic hand throttle is closely located to the rpm cruise-control switches enable the operator to comfortably and easily set the desired speed for each individual application. 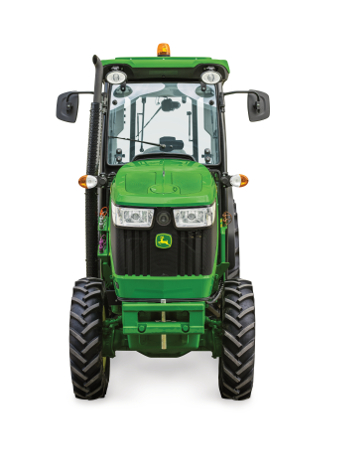 Both features come in base with all 5G Stage IIIB Series Tractors. All the controls are grouped together based on function and logically placed for easy, comfortable use throughout the day. Both cabin versions of the 5GF, 5GN, and 5GV can be equipped with optional electrohydraulic (EH) selective control valve (SCV) controls providing a high level of comfort. Those functions are enabled through the hydraulic deport block at the rear hitch, which fixes the sway blocks or moves the implement electrohydraulically. The implement can be adapted to uneven grounds or can be moved horizontally. Furthermore, the lower links of the rear hitch can be locked. 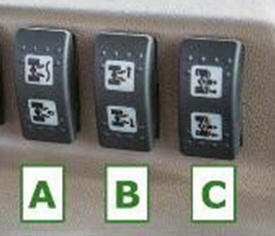 All these functions are activated electrohydraulicaly with three switches at the right-hand console. 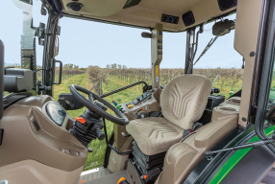 Performance: the redesigned cabin of the 5GF and 5GN is in terms of comfortable seating, entering, and exiting the cabin, one of the most comfortable cabins in the narrow tractor market. 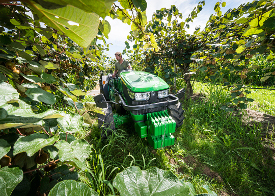 The narrow cabin of the 5GV Series offers protection for the operator and the crops in the rows. Including premium and conveniently located controls, the 5G Series offers comfortable productivity all day. Due the reduction of the front axle support, the 5G Stage IIIB Series offers a greater steering angle and an improved turning radius. Due to the reduction of the front support by 88 mm (3.5 in. 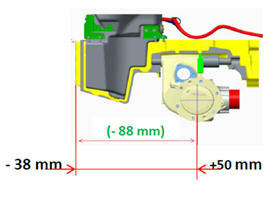 ), the steering angle of the 5G Stage IIIB Series has been enlarged due to the changed shape of the front axle support. On the N and V models, this change has a bigger impact. On the V, for example: from 20 degrees to 43 degrees (more than 100 percent improvement). 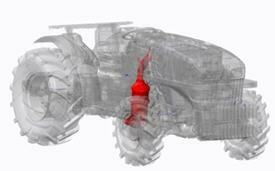 Maneuverability is one of the main operator needs, which will be reached through a tighter turning radius. 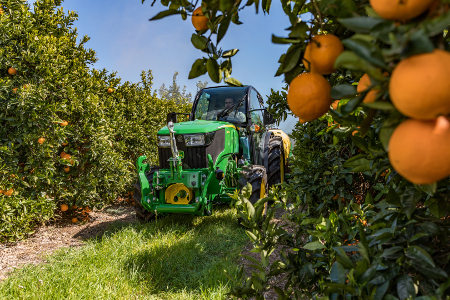 Performance: The 5G Series provides highly competitive maneuverability, allowing the operator to easily turn from row to row without the need of reversing. 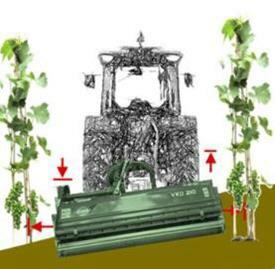 This results in easy and quick headland turns in everyday applications in orchards and vineyards. 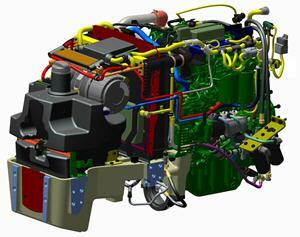 The 5G Series is equipped with a powerful Stage IIIB diesel only engine. Through the compact 4-cylinder, 3.4-L (0.9 gal. ), the 5G Series comes with more premium solutions over its previous model, like more horsepower and Intelligent Power Management (IPM) options. 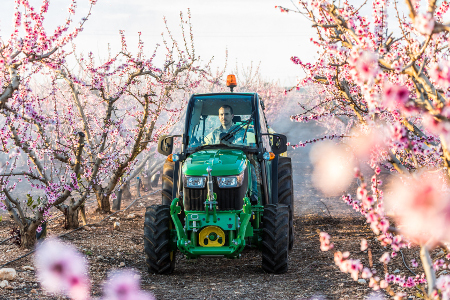 With an increased constant power range, torque rise, and a higher service interval, the 5G Series provides real power to power take-off (PTO) driven implements like vineyard and orchard sprayers. Compared to the 5GF, 5GN, and 5GV Series, the 5GL Series engine has a different cooling system and a more compact envelope in order to maintain the low height. The Stage IIIB 5GF, 5GN, 5GV, and 5GL Series from 55.9 kW to 78.3 kW (75 hp to 105 hp) are equipped with a powerful 3.4-L (0.9-gal.) 4-cylinder engine. The compact 3.4-L (0.9-gal.) engine provides a compact and light 5G solution with a short wheelbase and excellent visibility. The raised platform and the compact envelope of the 5GF, 5GN, and 5GV aftertreatment system guarantees the same, clear forward visibility. With the lowest possible height from the center of the rear axle to the top of the hood of 800 mm (31.5 in. ), the 5GL is a real low-profile solution. In order to maintain the low height of the 5GL Series, the aftertreatment system and the cooling system have a different layout outside of the hood compared to the 5GF, 5GN, and 5GV Series. 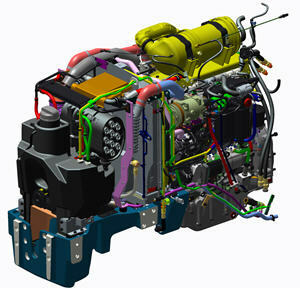 The 5G Stage IIIB engines offer more horsepower, including optional IPM. The 5GF and 5GN Series can be ordered as 78.3-kW (105-hp) models and the 5GL Series is available as 74.6-kW (100-hp) model. All 5G Series are available as 67.1-kW (90-hp) models. The optional 10 IPM available for the 5090GF/GN/GV and the optional 5 IPM for the 5105GF/GN with the 24/12 PowrReverser™ transmission provide additional power. Through IPM available with the 5090GF/GN/GV Series, an additional 7.46 kW (10 hp) can be reached at 2000 rpm. At this point, the performance increases from 91 hp (67.1 kW) to 101 hp (74.6 kW). The IPM option available with the 5015GF/GN Series provides additional 3.7 kW (5 hp). At 2000 rpm the performance increases from 105 hp (77 kW) to 111,5 hp (82 kW). 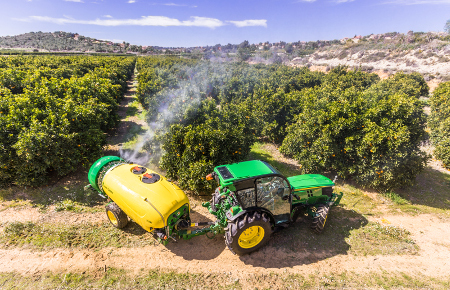 The optional IPM provides more power for heavy transport and PTO applications like spraying. IPM is only available with the PowrReverser™ transmission. NOTE: Also, the 5GL Series can be equipped with the PowrReverser transmission but there is no IPM option available. In addition to the different IPM options, the engine ensures high productivity under diverse working conditions. With a high torque rise (up to 31 percent) and a high constant power range (up to 400 rpm), the engine ensures the appropriate performance for versatile operations. 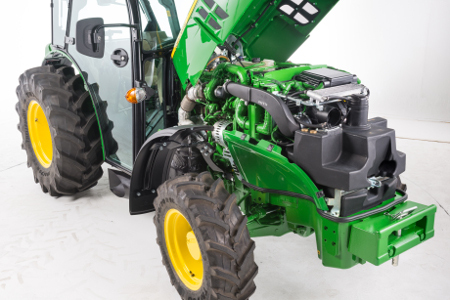 Through a modern injection pump, a common rail system, an efficient charge air cooling system, and a turbocharger, the 5G Tractors are able to reach the stringent Stage IIIB emission regulations without the cost and disadvantages of the selective catalytic reduction (SCR) technology. The service interval of the engine increased by 100 percent from 250 hours to 500 hours. This decreases maintenance costs and increases time in the field. Uptime, Cost of Operation, and Performance: The engines provide an increased service interval and more time in the field. 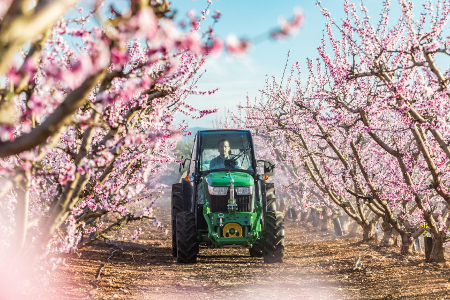 The compactness of the engines ensures that the tractors have the right dimensions for diverse high-value crop plantations. 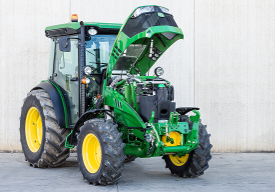 The 5GL Stage IIIB Series provides a wide range of improvements, all of which enhance the capabilities of the John Deere low-profile solution. The 5G Series is equipped with a powerful Stage IIIB diesel only engine. Through the compact 4-cylinder, 3.4-liter (0.9 gal.) engine, the 5GL Series comes with more premium features over its previous model, like more horsepower options. 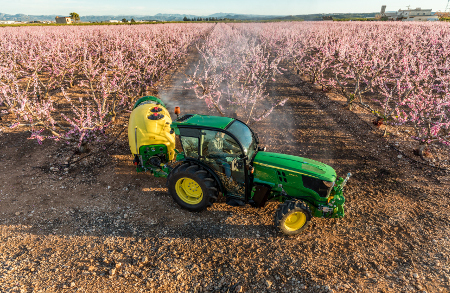 With an increased constant power range, torque rise, and a higher service interval, the 5GL Series provides real power to power take-off (PTO) driven implements like vineyard and orchard sprayers. The electronic hand throttle and rpm cruise control come as base equipment for the 5GL Series. The 5GL Stage IIIB Series is available with more horsepower models, including the 5100GL. The 5GL Series will be offered with a low-profile cab ex factory. As opposed to drop-on solutions, the low-profile cab is a 100 percent integrated solution, providing more comfort and protection to the operator. Raising and folding the rollover protective structure (ROPS) will not be required anymore when skipping in and out of the field. 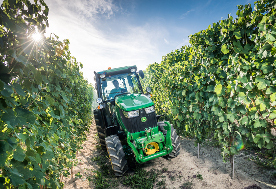 Having a fully integrated solution, the low-profile cab has been thoroughly tested and validated by applying John Deere standards. 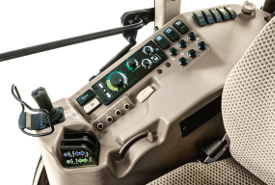 The pressurization and noise level inside the cab is improved compared to aftersales solutions. Even providing a fully homologated cab solution, there are no compromises in height or ground clearance. Furthermore, the low-profile cab offers excellent front visibility and rear visibility. The 5GL Stage IIIB Series offers two more width options. The 5GL Series can be ordered with different front and rear axle combinations in order to reach an overall width that is based on the 5GN Series (N-Width). This allows the perfect fit for different orchard plantations where branches and fruits limit the row width size, like kiwi. Furthermore, a 5GL low-profile cab will be offered ex factory. In order to maintain the low height, the 5GL with the homologated low-profile cab will be equipped with another front and rear axle combination. Therefore, the 5GL F/N-width version with the low-profile cab is between the 5GL F-width and the 5GL N-width. Hence, the 5GL F/N-width version is perfect for narrow orchard plantations as well as for wider tendon or pergola vineyards. *5GL (N): Available as open operator station (OOS) version only. 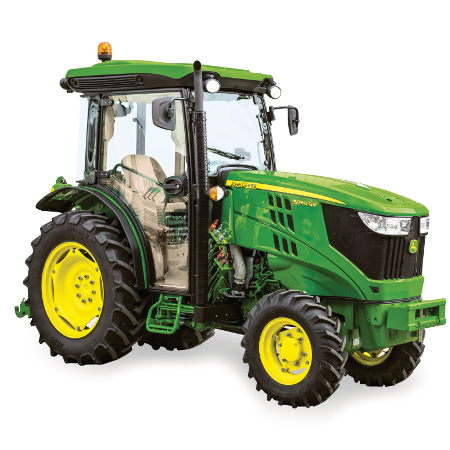 The tractor overall width is based on the 5GN Series. **5GL (N/F): Available with the low-profile cab only. 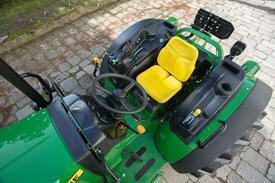 The tractor overall width is between the 5GL N-width and the wider 5GL F-width version. ***5GL (F): Available as OOS version only. 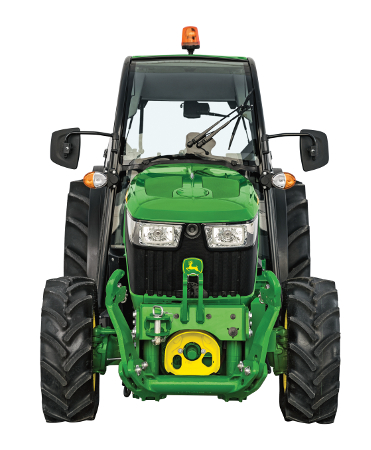 The tractor overall width is based on the 5GF Series. The 5GL Series is available with the 24F/12R PowrReverser transmission. NOTE: The dashboard, steering column, and reverser lever of the 5GL are designed according to the 5G Stage IIIA (model year 2014) layout in order to maintain the low height. The first pump supplies 29.8 L/min (7.9 gpm) hydraulic flow at 130 bar (13 MPa) to the steering circuit, transmission control circuit, and lubrication circuit. The second pump delivers 66.8 L/min (17.6 gpm) hydraulic flow at 190 bar (19 MPa) to the selective control valves SCVs) and rockshaft. For the first time, the 5GL Series can be equipped with the third hydraulic pump. On the 5GF, 5GN, 5GV, and 5GL Series, the third hydraulic pump delivers up to 29.8 L/min (7.9 gpm) hydraulic flow at 190 bar (19 MPa) to SCVs and rockshaft. If the 5G Stage IIIB Series is equipped with the three hydraulic pumps, the total hydraulic flow sums up to 126.4 L/min (33.4 gpm). This outstanding flow ensures excellent hydraulic performance and capacity. Performance: The compactness of the engine ensures that the 5GL Stage IIIB Series has the right envelope and sufficient power for diverse high-value crop plantations. 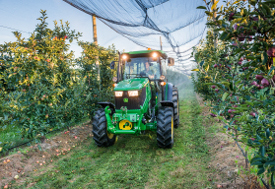 The 5GL Series enables the orchard and vineyard growers to operate in wide pergola/tendon rows as well as in narrower orchard rows like citrus, kiwi, apple, pear, and peach. 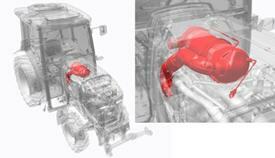 The fully integrated low-profile cab provides maximum comfort and protection during spraying applications. Together with the optional PowrReverser transmission and the third hydraulic pump, the 5GL is suited for heavy-duty applications and long working days.